The recall of hemp-protein powder (brand: Veganz, April 2016) shows that the term Tetrahydrocannabinol (THC) is being used imprecisely and the coverage of it is undifferentiated. Limits are stated even though only recommendations which of their part are based on the content of total-THC or on the content of delta-9-THC exist. In the present case, the analytically determined total THC-value used for the evaluation of hemp foods is confused with the EFSA-Recommendation for Delta-9-THC. Therefore, irrespective values are being correlated to each other. General recommendations for the intake of pure THC per kilogram body weight are falsely applied to the guidance levels of Total-THC of edible foods. Often the term „THC“ is used without differentiation between total-THC and delta-9-THC. The total-THC-content is composed of psychoactive delta-9-THC, which under some circumstances can be found in hemp food and the not psychoactive pre-stage of delta-9-tetrahydrocannabinolic acid (THC-A). THC-A is converted into delta-9-THC during the analytic THC-determination. The proportion of THC-A in fresh hemp plants and on the outer shell of hemp seeds is up to 90 percent. The total THC content after its analytic determination is also stated as the value of delta-9-THC although in reality the psychoactive substance of delta-9-THC in analyzed foods quantity-wise lies clearly below the analytically determined content of total-delta-9-THC. This is also true for the THC values on “lebensmittelwarnung.de” (appendix). For further statements regarding THC-analytics see „Analytical method of THC Determination“ (pg. 4f.). No mandatory limits exist for total THC and delta-9-THC respectively in foods and its daily intake per kilogram bodyweight neither in the EU nor in Germany. Also the WHO has not yet set corresponding limits. For substances which can cause impairment of health due to their toxicity already by non-recurring or temporary exposure the acute reference dose (ARfD) defines a toxicological limit. To be differentiated from this is the toxicological limit for the acceptable daily intake (ADI). The ADI refers to the chronic effect of a substance and describes the amount of a substance a consumer can ingest daily and during a lifetime without noticeable health risk. The definition and calculation of the ARfD and ADI values are internationally harmonized. The Bundesinstitut für Risikobewertung (German Federal Institute for Risk Assessment BfR, formerly BgVV) published in July 2000 an ADI of 1 to 2 microgram per kilogram bodyweight  considering an uncertainty factor of 20 to 40  for the daily intake of total THC based upon a minimum effective dose of 2.5 milligram per day and person (male, 70 kilogram). Thereby the BfR assumed a chronic effect of THC. 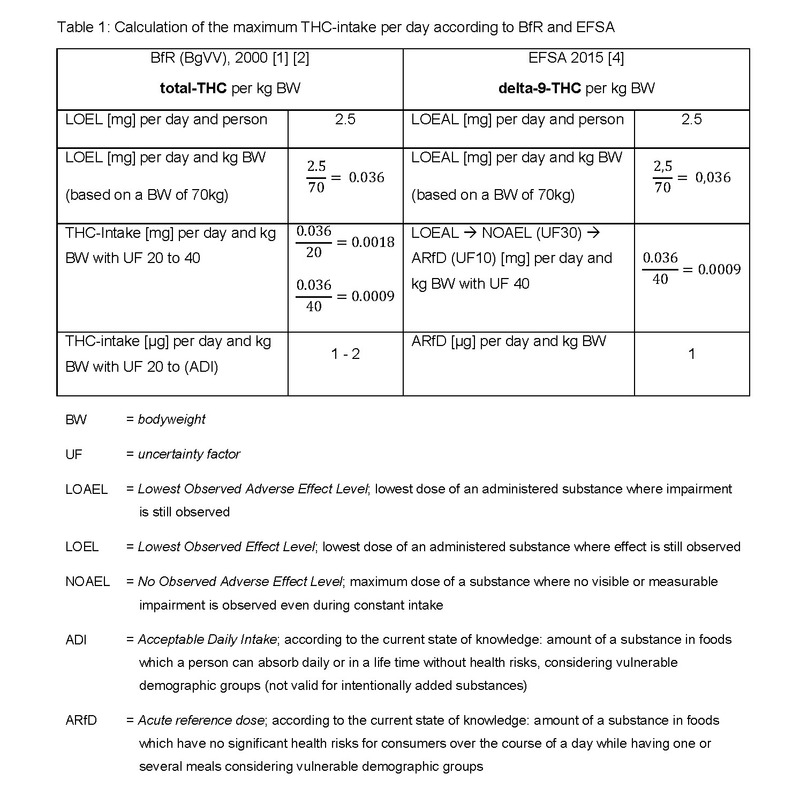 Based on this calculation the BfR has released guidelines for THC found in hemp foods for Germany in 2000 and confirmed those in 2006. Guidelines are de jure non-binding recommendations for which slight exceedance is generally tolerated. Products are to be considered impaired when the guidance value is exceeded by more than double. The European Food Safety Authority (EFSA) is pursuing a different approach. In the context of the EFSA’s scientific opinion towards „Risks of THC in Milk and other foods with animal origin to human health“ in 2015, for the first time the EFSA recommends an ARfD of 1 microgram pure delta-9-THC per kilogram body weight based on the same effect dose as the BfR. The uncertainty factor and the ARfD were justified by the observable effects on the central nervous system (mood changes, sedation) and the measurement of an increased heart rate shortly after administration of delta-9-THC. The value of 1 microgram delta-9-THC per kilogram bodyweight has now been applied in the current case regarding hemp protein powder in order to evaluate its food safety. The official (validated) method to determine THC in hemp oil is chromatography (GC)  in combination with mass spectrometry (MS) or flame ionization detection (FID). The analysis of food products containing hemp is carried out on the part of German authorities via standard GC-MS-method as well. Heat is deemed to be the main factor for transforming the non-psychoactive THC-A into the psychoactive delta-9-THC. Consequently, applying the GC-MS-method using temperatures from 260 up to 300 degree Celsius  only the content of total-THC can be detected. As stated before, the total-THC is also reported as delta-9-THC. Indeed, after analyzing the sample only delta-9-THC is present but the figure for delta-9-THC consists of the actual delta-9-THC content and the delta-9-THC content resulting from the transformation of THC-A. Thus, the actual content of delta-9-THC in the food product concerned should be quite lower than the analytically detected delta-9-THC-content due to the methodological determination of THC in food products. The main criticism concerning the risk-evaluation of hemp foods is the interpretation by reference to unequal values (total-THC versus delta-9-THC) which is essential for estimating the marketability of a food product by calculating the percentile THC-coverage-rate for the ARfD. Therefore, it is necessary always to ensure that for each evaluation the right values are being compared. Where reference is made to the EFSA recommendation the delta-9-THC-content (most accurate method: HPLC) is relevant, for comparison with the BfR recommendation it is the total-THC-content (GC-MS). The EFSA-value only refers to the intake of delta-9-THC per kilogram bodyweight without reference to the ready-to-eat foods. The EFSA does not recommend any delta-9-THC-content for ready-to-eat food. Hence, the evaluation of the hemp protein powder is falsely made on the basis of the also “false” THC value for the ingredient only but not for the ready-to-eat foods. Hemp protein powder is typically stirred into juices, milk shakes and smoothies which are consumed without being heated. Therefore, a transformation from THC-A in delta-9-THC by means of heat exposure can be ruled out. These hemp protein powder mixed drinks defined as prepared, ready-to-eat foods fall into the BfR-guideline as „any other foods“ . For this product category a total-THC-reference value of 0.15 milligram per kilogram ready-to-eat food is applied. The EFSA provides no information about the THC-content in ready-to-eat foods. The European Industrial Hemp Association (EIHA) recommends 3.5 milligram per kilogram for a ready-to-eat product being prepared with hemp protein powder. The calculation depends on the composition of the ready-to-eat product (proportion of the ingredients). Thereby, the recommended daily amount considering a bodyweight of 15 kilogram would be nearly exhausted. With sufficient energy supply and a well-balanced nutrition the protein requirement is usually covered by the person’s diet. Thus, supplementation entails the risk of overdosing protein which may damage the organism for instance the kidneys if adequate fluid intake is not provided. In case of medical necessity products should be chosen which are aligned with the nutrient requirements of children. The simplified advice brought up by the media coverage, stating that consumers should rely on protein sources such as nuts or soy cannot be followed unconditionally. These foods are known to have a high allergenic potential. Even though hemp seeds (raw material for hemp protein powder) are from a botanical view also considered nuts they do not have an allergenic potential. Moreover, the issue of potentially overdosing protein in an infant nutrition is a problem for all protein products used for supplementation regardless of the used main component (protein of soy, nuts, milk). The varying density of CB1-receptors (cannabinoid-receptors found especially in the central nervous system) as a part of the endogenous cannabinoid-system of children and adults has not yet been regarded for the consideration of the guidance values. These receptors play a role in coordination of movement, processing of sensory impressions, pain processing and memory. As delta-9-THC docks to these receptors it unfolds it’s psychoactive and for foods unwanted effects. Clinical studies show that young children react considerably less sensitive to delta-9-THC than adults and that they also tolerate a higher ratio of THC compared to bodyweight. This might be due to the lower density of CB1 receptors. Therefore, it should be noted that the standard value of 1 microgram THC for adults is not necessarily transferable to infants. Basically, the administration of protein supplements to two to three year old children without a medical indication is not automatically advisable. It is correct to withdraw food products from the market if they are potentially hazardous. However, all information to the public must be objective and adhere to the facts. The discussion of the THC-issue should be handled in a careful manner and the risk assessment should be based on valid information and facts in order not to compare incomparable facts. It is desirable, that a reasonable evaluation of risks coming from foods containing hemp is based on valid data considering all the different aspects.